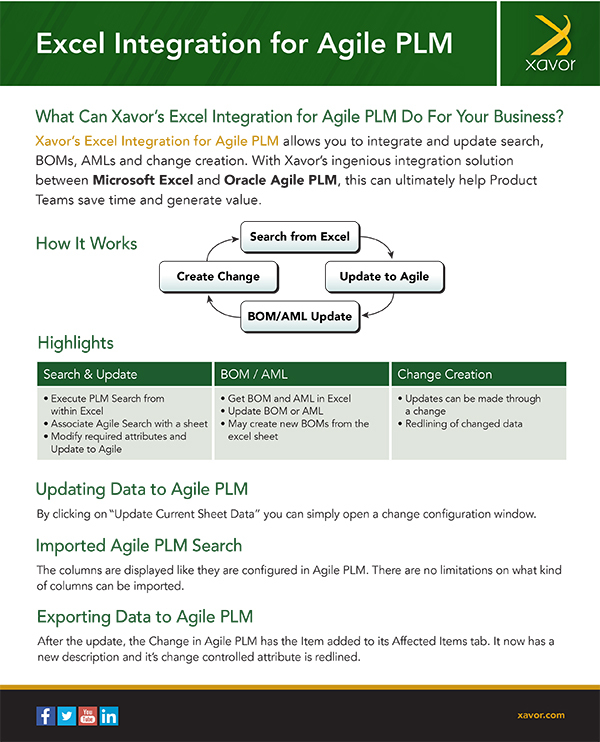 Xavor’s Excel Integration for Agile PLM allows you to integrate and update search, BOMs, AMLs and change creation. With Xavor’s ingenious integration solution between Microsoft Excel and Oracle Agile PLM, this can ultimately help Product Teams save time and generate value. By clicking on “Update Current Sheet Data” you can simply open a change configuration window. of columns can be imported. new description and it’s change controlled attribute is redlined. Multiple BOMs can be pulled at the same time by providing a comma separated list of item numbers. After the update, the Change has been created and the Item has been added to the Affected Items. The change in quantity in the BOM has also been redlined. Multiple AMLs can be pulled at the same time by providing a comma separated list of item numbers. After the update, the change has been created and the item has been added to the affected items. The deletion of the manufacturer has been shown in the redlines. If all of the sheets opened in Excel are saved searches, BOMs or AMLs, and need to be added to a single Change Order, then you can go ahead and click Update All.